In February 1969, the U.S. Navy selected Grumman Aerospace Corporation to produce a new fighter for air superiority, fleet air defense and precision strike capability against ground targets. That fighter became the F-14 Tomcat, last in a long line of Grumman cats for the Navy. The F-14’s first flight was on December 21, 1970 at Calverton, New York. The first Tomcats deployed with Navy training squadron VF-124 on October 8, 1972 at NAS Miramar, California. The Tomcat has a crew of two; the Pilot and the Radar Intercept Officer who operates the AWG-9 weapons control system. The F-14 has visual and all weather attack capability to deliver ordnance in the air-to-air role. It can detect hostile aircraft at ranges over 100 miles and has the ability to launch missiles at six different targets at once. 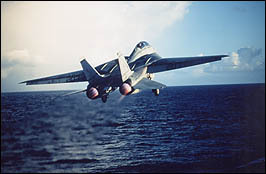 The Tomcat also has the capability to "look down and shoot down" extremely small targets and operate in a hostile electronic environment. On the weapon stations the F-14 carries up to six AIM-54 Phoenix long-range missiles, or six AIM-7 Sparrow medium-range missiles, and up to four AIM-9 Sidewinder short-range missiles. A mixed load is usually carried. Internally the F-14 is equipped with a M61A1 Vulcan rotating cannon with 675 rounds of 20mm ammunition. With the LANTIRN targeting system pod the F-14 can deliver various laser-guided bombs precisely on target. Augmented with the Tactical Air Reconnaissance Pod System (TARPS), the F-14 is the Navy’s only manned tactical reconnaissance platform. Two other versions, the F-14B (F-14A+) and F-14D with General Electric F110 engines, were produced. By July 1992 a total of 632 F-14s were produced for the U.S. Navy and 80 for Iran for a total of 712 aircraft. 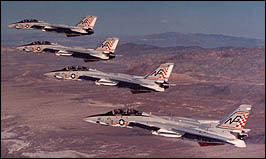 Many F-14As were converted to F-14B and F-14D configuration until 1994. The Tomcat in our collection is the third pre-production aircraft built having first flown on December 28, 1971 at the Grumman Flight Test Facility at Calverton, New York. Primarily used for determining structural loads and flight characteristics under many extreme conditions No. 3 last flew in 1990. The museum obtained this aircraft in 1995 and moved it over-the-road from Calverton in one piece. To read more about the Tomcat, see First Flight of Tomcat 200, by Tom Gwynne under our Aircraft section.